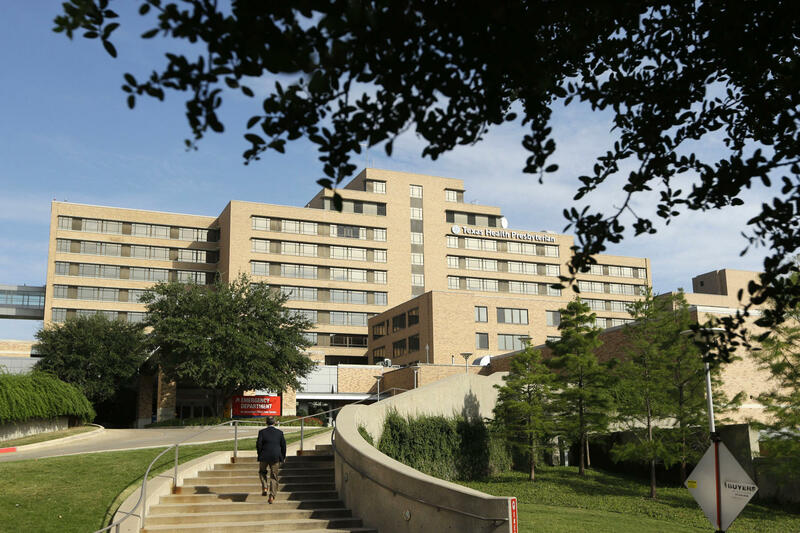 A patient at the Texas Health Presbyterian Hospital in Dallas has a confirmed case of Ebola, the Centers for Disease Control and Prevention says. He is being treated and kept in strict isolation. The Centers for Disease Control and Prevention confirmed Tuesday that the first case of Ebola has appeared in the U.S.
A man in Dallas has tested positive for the virus, the agency said. The man flew to the U.S. from Liberia, arriving on Sept. 20, NPR has learned. He wasn't sick on the flight, and had no symptoms when he arrived. He first developed symptoms on Wednesday, Sept. 24, according to the CDC, and first sought care on Friday. On Sunday, he was placed in isolation at Texas Health Presbyterian Hospital in Dallas, according to the Texas Department of State Health Services. Health officials have already started reaching out to people who may have come into close contact with the man. The virus is spread only through direct contact of bodily fluids, and it isn't contagious until a person starts showing symptoms. A "handful" of people may have been exposed to the virus, CDC Director Dr. Tom Frieden said Tuesday at a news conference. These include several family members of the man and a few people in the community, Frieden said. The man could have passed Ebola to these people during the four days when he was sick but not yet isolated. But passengers on the plane with the man were not exposed to Ebola, Frieden said. "There is zero risk of transmission on the flight. He was checked for fever before getting on the flight." The CDC has been planning for an Ebola case in the U.S., Frieden said. And the agency, together with state health departments, has successfully dealt with similar viruses — Lassa and Marburg — on five previous occasions. "The bottom line here is that I have no doubt that we will control this importation, or case of Ebola," he said, "so that it does not spread widely in this country." This isn't the first time somebody has been treated for Ebola in the U.S. Several American aid workers in recent months caught the virus while working in West Africa and were flown back to the U.S. for treatment. But it's the first time the disease has been diagnosed in a person in the U.S. The CDC is sending a team to Dallas to work with state and local health officials. The Ebola epidemic in West Africa continues to grow rapidly. As of Thursday, there have been more than 6,500 cases across Liberia, Sierra Leone and Guinea. More than 3,000 people have died of the disease, the World Health Organization says. Specialists studying infectious diseases have predicted for weeks that a few Ebola cases would likely turn up in the U.S. And hospitals around the country have been preparing to diagnose and treat such cases. Because Ebola only spreads through body fluids, officials say that any case like this will likely be quickly identified and contained, and not lead to a widespread outbreak like the one happening now in West Africa.